(CNSNews.com) – The debt of the federal government has grown $16,955,289,814,977.42 during the 32 years that current Senate Minority Leader Harry Reid of Nevada has served in the United States Congress. That equals an increase of about $145,131 for every household in the country. There have been five presidents during that time, including three Republicans (Ronald Reagan, George H.W. Bush, and George W. Bush) and two Democrats (Bill Clinton and Barack Obama). 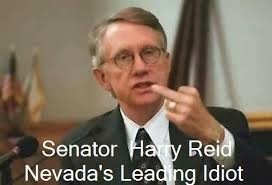 Reid was first elected to the House of Representatives in 1982 and then was elected to the Senate in 1986. He first took office in the House on Jan. 3, 1983, the first business day in January of that year. At the beginning of that day, according to the Monthly Statement of the Public Debt for December 1982, the total public debt of the federal government was $1,197,073,000,000. Reid announced today he would not seek reelection in 2016. As of March 25 of this year, the latest day for which debt numbers are available, the federal debt was $18,152,362,814,977.42. That means that since Reid first joined Congress in 1983, the federal debt has increases $16,955,289,814,977.42. As of December 2014, According to the Census Bureau, there were 116,827,000 households in the United States. The $16,955,289,814,977.42 that the debt has increased since Harry Reid first joined Congress thus equals $145,131.60 per household.